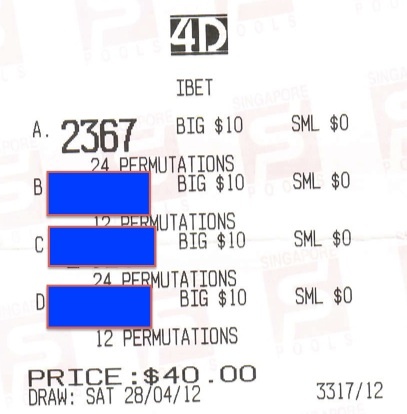 Our Weekly 4D tips also capture the 1st prize number 2367 on 28 April 2012. This weekly 4D tips is specially cater for member who are very busy and unable to do analysis. We shortlist the most important statistic from our software and categories them in the note. At the end of the note, we will do a summary of all the finding to a small group of best of the best 4D. All you need to do is to use the note as a reference and pick the system or direct numbers from the note. It is only $40 per week or $120 for 4 weeks(Special discounted). Below is the winning ticket on the system 2367.